Victoria Miro is pleased to present Corrections, new collage work by American artist Christian Holstad in his third exhibition with the gallery. Corrections looks at various types of borders, boundaries and constraints in our environment that impact our lives, from the political and governmental to the social and personal. Borders and boundaries can be physical, like the gated communities of suburban towns, or unseen, like the surveillance of intelligence agencies including the National Security Agency and the Government Communications Headquarters. In recent years phone-hacking scandals and leaks from whistleblowers like Edward Snowden have led to a fundamental questioning of personal privacy. In light of these revelations there has been a reassessment of what constitutes safety and threat and a reassertion of the rights of the individual in the community. Working with hand-cut paper collage, Holstad builds up his material in layers. A central focus of Corrections will be a large collage work comprising eight separate panels spelling out the word ENTRANCE in reverse. Each collaged letter is made of metallic paper that has been meticulously hand cut to resemble chain-link fencing. The reversal of the human-scale letters acts to place the observer inside the fence. The reflective quality of the metallic paper enables viewers to see their own image, directly implicating them in Holstad's landscape. 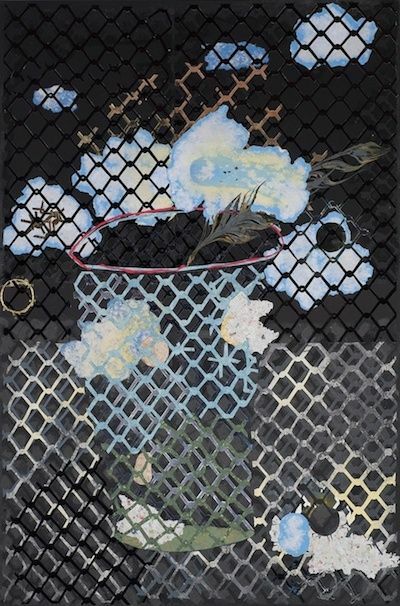 Holstad's chain-link fence separates the viewer from a nameless urban back lot replete with a row of garbage cans and other street detritus, motifs familiar from the artist's earlier work. Flashes of red, blue and white appear through each of the eight panels, the reflective glare of an unseen police car's oscillating warning light. Made from galvanised steel, chain-link is a ubiquitous urban barrier. In recent years, the connotations of the chain-link fence have shifted from the mundane and everyday - the make-shift car park, city park and sports field parameter - to the decidedly more sinister - the internment camp, government holding cell and country border security. This work is the artist's contemporary riff on the traditional concept of the sublime: here the artificial, constructed environment, rather than natural world, is the source of infinite and potentially terrifying beauty. The exhibition will also include a series of smaller collages featuring goldfish caught in the involuntary confines of the aquarium and the fishing net. Like the figures confined by chain-link alluded to in the multi-panel work, these fish appear to exist primarily to be observed. However they provide a lighter, more lyrical take on Holstad's interest in voyeurism and perspective.